Besides gathering the loose tea and spices (which I ordered from Mountain Rose Herbs), I needed containers. My kids and I hit a few thrift stores looking for them. It was really fun to shop with them and see what containers caught their eye. They quickly learned that I was not looking for any typical Christmas cutesy containers. In fact, I think we picked only one “Christmas” container – it was a square glass votive holder with an embossed Christmas tree on each side. 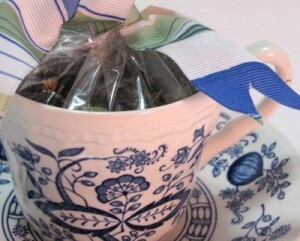 Other than that we picked eclectic tins, boxes, small tea cups, and votive holders. I paid $1.75 for one of them – because it was an antique tea cup from England, but most of them were around 50 cents each. Anyway, that was fun. 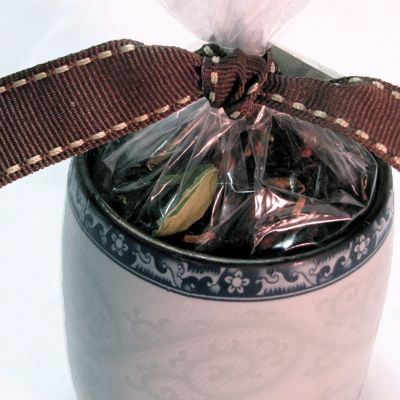 There are many options for containers for these gift mixes; don't be afraid to think out of the box! I'll list the ingredients and their amounts – enough to make one batch of Chai Tea. You'll have to double it, triple it, quadruple it, etc. depending on the size of your container. Most of my containers required triple or quadruple batches to fill them up. A triple batch makes a little over 1/2 cup of mix; a quadruple batch makes about 3/4 cup of mix. I advise that you create the gift mixes one at a time to ensure that each gift gets its true share of all the whole spices. 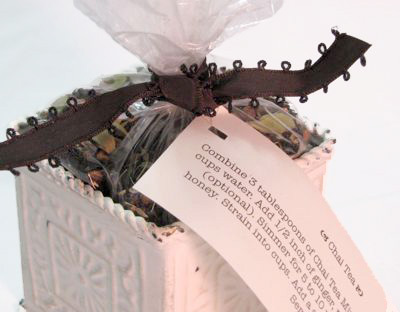 Also note that the liquids (water, milk and honey), vanilla, fresh ginger, and nutmeg have been omitted from this gift mix; the recipient will add those when s/he is making the tea. Please choose organic spices and tea. This is a great task to share with children – they love to count and measure out all the ingredients. Over. And over. And over. What's tedious to us is fun for them! Crush the cardamom pods and peppercorns. 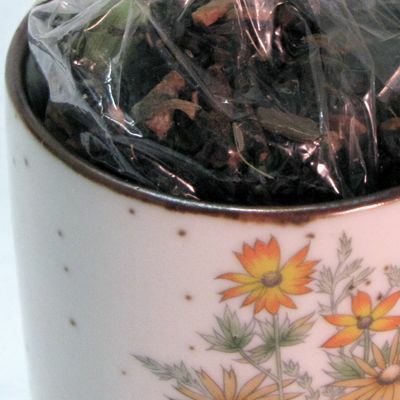 Then mix all the spices and tea leaves together and place in a plastic bag. Place that in the gift container and twist-tie it closed. Roll the twist-tie up on itself. Cover the twist-tie with a ribbon. Tie it with a bow or square knot (right over left, left over right…). Print or hand-write a label (see below). Hole punch the corner. 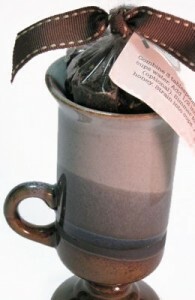 Use thread or a tiny ribbon to attach it to the bag of Chai Tea mix. Deliver! Another gift mix to create is to make this Homemade Herb Seasoning Salt and put it in a salt shaker with a ribbon around it. Do you have any handmade gift plans this year? What have you made in the past? Please share! 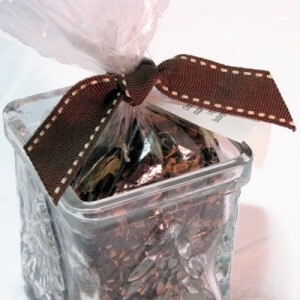 I'm sharing this in the special Handmade Gift Carnival @ The Nourishing Gourmet – visit to see more handmade gift ideas! 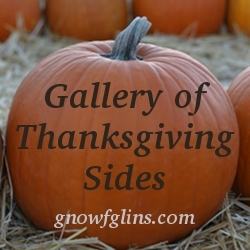 Today, I'm hosting the Gallery of Thanksgiving Sides, where I and gnowfglins readers share real food Thanksgiving side dishes. If you want to add a real food Thanksgiving side dish, let me know in the comments of the Gallery post. But no matter what, be sure to hop over there to see what else has been submitted! .-= Katy´s last blog post… Speaking of Bourdain… =-. I did this last year, but yours are so beautiful! I just used Weck canning jars. .-= Rebecca´s last blog post… Lacto-Fermented Veggies, Sourdough, Mayonnaise (Tuesday Twister – 11/17/2009) =-. Katy – Have fun! We’ve still got some more to do; the kids really enjoyed helping, too. That’s a cute idea! Thanks for sharing. .-= gilliebean´s last blog post… MILK =-. .-= Mindy´s last blog post… preparing for childbirth =-. Mama Rissa – Have fun with it! I’d love to hear more about what gifts you’ve made in the past. Mindy – Thanks! 🙂 Praying for you – the move and the birth! .-= Kimi @ The Nourishing Gourmet´s last blog post… Handmade Gift Carnival =-. You have a great eye – I love what you’ve found at the thrift store. And your tea mix sounds fantastic. I still haven’t decided exactly what to give, but I am going to make your tea mix for me. 🙂 I do think I’ll make date truffles as one of the gifts. They look so beautiful and are really simple to make. Thank you, Amy and Kimi! I was considering infusing some agave nectar with cinnamon stick, some with vanilla bean, and some with lemon zest…. then putting them into squirt bottles. I plan to give these to family and friends to use with coffee or whatever they like. I haven’t doent his before, but I am sure the cinnamon and vanilla ones will be good. .-= Sustainable Eats´s last blog post… Thanksgiving Dinner Menu =-. Sustainable Eats – Good question! One batch of this is about 3T and what you need for one pot of tea – and it needs either a cinnamon stick or 1 teaspoon of cinnamon bark pieces. If you’re going to double, triple, or quadruple the recipe – use one cinnamon stick per batch/pot of tea. The amount of loose mix per batch would then be about 2-1/2 tablespoons plus a cinnamon stick. I just saw your response to my comment! I don’t want to hijack your comment section with more on the homemade gifts I’ve made – but if you’d really like to know more, let me know where I should write you! 🙂 No pressure, though! .-= Mama Rissa´s last blog post… Still Brand New =-. Mama Rissa, I’d like to hear more ideas. Do you have a blog entry you can link to maybe? .-= Sustainable Eats´s last blog post… Gearing Up for Christmas Shopping? =-. Fabulous idea! I’ve made chai mixes before too only I don’t put any tea in it – just spices. It’s pretty incredible with just spices alone. Love the idea for containers too. Easy to get any of those second hand and it still looks great! .-= Melodie´s last blog post… Breastfeeding Should Not Be Blamed For Tragic Accident =-. I bet coconut milk would be good too, for non-dairy friends. What do you think? ?